Productive Carbides, Inc., has been manufacturing and modifying tools for cutting wood, metal and stone for more than 30 years. We use tungston carbide, a man-made compound, for extra strength and durability. Our fabrication company can apply carbide as grit, rod, tubes and shapes in a variety of mixes of binder and tungsten to tools for a variety of applications. 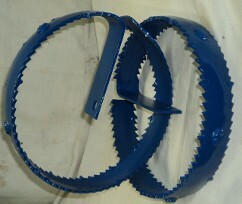 At the request of sewer cleaning operators, Productive Carbides, Inc., started modifying their steel saws by brazing carbide teeth and wear pads to the blades. This reduced cutting time and extended tool life, up to 10 times the customer reported. By word of mouth, the improvements that Productive Carbides, Inc., made to the blades was communicated to other contractors and sewer departments. Productive Carbides, Inc., has standardized the carbide tooth placement and wear strip positioning to provide an inventory of saws for fast response. We inventory 6-, 8-, 10-, 12-, 15- and 18-inch blades in flat and concave shapes. 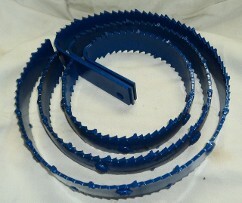 We can customize your saws by adjusting teeth spacing or carbide grades according to your needs. Contact our fabrication company in Cincinnati, Ohio, to learn more about our custom carbide tools. Carbide has been used for years to cut metals. Carbide inserts in milling tools or carbide brazed onto steel shanks are used around the world in machine shops. Productive Carbides, Inc., has many years experience manufacturing both carbide inserts and tipped steel tools for a variety of industries. A similar situation exists in the wood industy. Steel blades are widely used in the saw mills and lumber yards. High-speed shapers use carbide blades to speed the crafting of wood work. 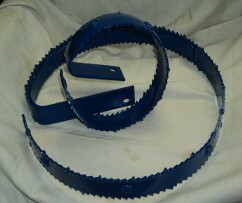 Productive Carbides, Inc., has made carbide shaper blades and log stripping tools for various customers. Stone cutters face the same problems as metal and wood workers. Productive Carbides, Inc., has made special carbide blades which have been used to create decorative stone for residential and commercial buildings such as The Pentagon.